We are excited to be using the Maritime Conference Center for this event! 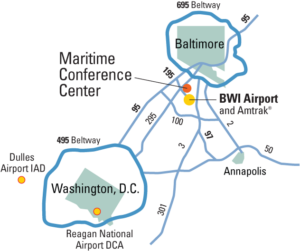 The Maritime Conference Center sits on over 80 beautiful acres of land and is located just 4 miles from Baltimore Washington International Thurgood Marshall (BWI) Airport. This event center has some rather amazing facilities available to us, including plenty of room for us to grow the conference in the future. It has hotel facilities built on the property and offers a complimentary shuttle service, not only from the airport but to surrounding businesses as well. For those who will be driving to the event, the facility provides free parking for the entirety of your stay. And for anyone that decides to stay at the hotel, the rate that we have includes all of your meals, not only lunch and breaks during the conference, but breakfast & dinner are included in your hotel rate! As mentioned, the hotel rooms are part of the venue, and include a lot for the price! Parking, shuttle, wifi, and all meals (breakfast, lunch, dinner) are included in your hotel booking. The rate for this will be $155/night for Single Occupancy or $200/night for Double Occupancy. Online reservations have ended but you can still make your hotel reservation by contacting the reservation department at (866) 900-3517 and state that you are with the Mid-Atlantic Developer Conference. Flying: The venue offers a free shuttle from BWI airport (and it is the only close airport). There are additional details on the MCC’s website. Public Transit Options: Both Amtrak and MARC train services can take you directly to BWI, allowing you to then use the hotel shuttle to reach the venue.